Join us for a celebration of women and entrepreneurship! Learn about your own entrepreneurial potential! 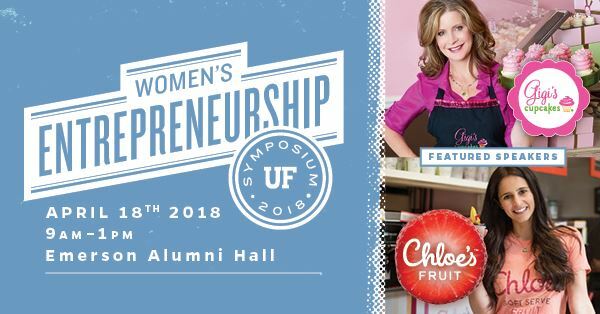 The UF Center for Entrepreneurship & Innovation is pleased to present the 2018 Women’s Entrepreneurship Symposium, featuring the Founder of Gigi’s Cupcakes - Gina Butler, the Founder of Chloe’s Fruit - Chloe Epstein, and five other amazing entrepreneurs. The Women’s Entrepreneurship Symposium will be a half day of learning, sharing and inspiration, culminating with an exciting and fun-filled lunch with Gina Butler Through amazing stories and speakers, you will see first -hand the empowering potential of women’s entrepreneurship. The Symposium will take place on Wednesday, April 18, 2018 from 8:30 to 1pm, in the Emerson Alumni Hall. The breakfast at 8:30, the symposium starts at 9am. The Women’s Symposium is FREE for UF Students, Faculty & Staff. Presented in partnership with the Collaboratory for Women Innovators and the Center for Women's Studies and Gender Research.